I’ve been experimenting with so many flavors, that I wanted to try something very classic and simple, similar to my mango con chile paletas recipe that I shared here a few summers ago. I can’t seem to eat enough mango this year, and I brought back a bottle of chamoy from Mexico when we visited earlier this summer. This recipe is similar to a mangonada or chamoyada, just blended together and frozen in paleta-form—but you’ll definitely recognize this classic Mexican flavor combination. I’ve started calling my Mexi popsicles made in my Zoku machine “Zokuletas” (insert cheesy grin here). Let’s see if we can make it catch on! 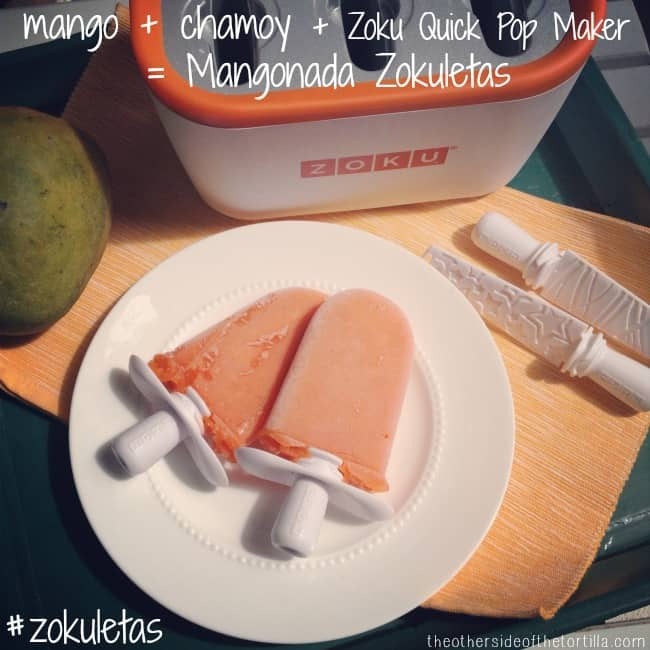 A quick and easy mango-chamoy treat for the dog days of summer, using a Zoku Quick Pop Maker. Peel the mango and cut all the flesh from the seed. Place the flesh in a blender or food processor, and then squeeze the remaining juice from any flesh still clinging to the seed. Add 3 tablespoons of cane sugar, 3 tablespoons of liquid chamoy and 1 tablespoon water to the blender. Seal the lid and puree until completely smooth. Place sticks in your Zoku quick pop maker and pour the mango and chamoy puree to the fill line. Be very careful not to overfill them. Allow to freeze for 7-10 minutes or until they look completely frozen in the middle. 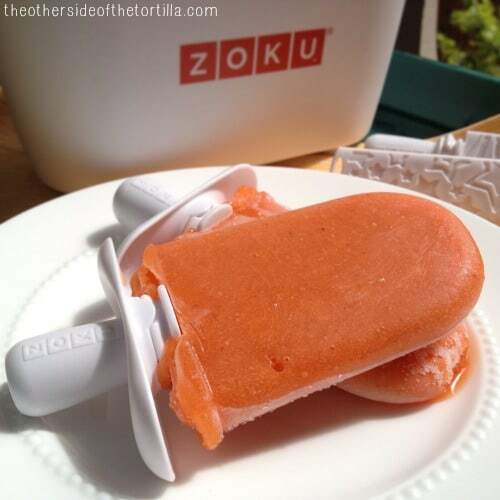 Remove from the quick pop maker mold using the Zoku super tool, add the clip on drip tray to the stick and enjoy! If you don't plan to eat your popsicles right away, store in a Zoku storage case or put two pops per sandwich baggie, placing one pop at each end of the bag and folding in the middle so they don't touch. Put the baggie in the freezer until you're ready to enjoy. Interested in making your own Zokuletas? Do you have a Zoku Quick Pop Maker? Share a link to your favorite recipe for Zoku paletas in the comments! So I have been making Zokuletas since early summer? Love it! And this is such a fun flavor. I need to try adding chamoy to a pop before summer ends.